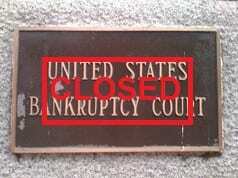 Bankruptcy Filings To Stop Due To Government Shutdown? -Use an attorney or risk not being able to file. October 10th is the day that bankruptcy courts around the country are to provide further guidance on whether the bankruptcy courts would remain open. On October 1st, bankruptcy courts around the country posted notices on their websites that they would remain in operation for 10 days despite the shutdown. Additionally, notice was given that unless additional funding was provided by October 15th the courts would have to close. So the best answer is that the courts will have to close if no change by October 15th. However, the status of the bankruptcy courts operation is a little vague for the time between October 10th and October 15th. The courts are separate from the electronic system that allows bankruptcy filing for most people. My assumption is that the electronic system will still allow filings. Therefore, attorneys and those with access to electronic filing should still be able to file even after October 15th. However, should the bankruptcy court shutdown, it is assumed that the personnel at the “intake office”, a section of the bankruptcy clerk’s office, will be furloughed. This would make it impossible for individuals filing pro se cases or not represented by an attorney to file cases, amendments and meet required deadlines of the bankruptcy process. WHAT WOULD HAPPEN IF BANKRUPTCIES COULD NOT BE FILED? While in general the primary purpose of bankruptcy is the elimination or reorganization of debt, the filing of a bankruptcy also provides immediate protection against foreclosure, garnishments, levies and liens on property. Should homeowners facing foreclosure not be able to halt a foreclosure sale or workers not be able to halt garnishments, millions, if not billions of dollars, in property could be lost during the shutdown because taxpayers are unable to avail themselves of this important protection. Is it possible the government would allow your ability to file bankruptcy to be suspended by the government shutdown? Think about it. Hundreds of thousands of federal workers have been furloughed. The IRS has announced tax refunds for individuals filing during the shutdown will be held. The effect of this shutdown on people buying a house, trying to modify a mortgage, even receiving government benefits is pervasive. Does anyone believe that Congress or the President would worry about the impact of closing the bankruptcy courts given the magnitude of the financial devastation that has been already wrought on people? Think about it. 1) If you have been considering or need to file bankruptcy… DO IT NOW!! The government shutdown will suspend your ability to do it at a time you need it most and you could lose. DO NOT WAIT. TAKE CARE OF IT NOW. 2) Use an attorney. Much of the bankruptcy system is automated. If the intake office at the bankruptcy court closes you will not be able to file. Even if you have filed before it shuts down and you need to file amendments or further documents before the deadline, your case can automatically dismiss. Too many bankruptcy self-filers already have difficulties. Use an attorney. A footnote about history: We are all patriotic and love our country. We want to believe our government will do right by us. So some part of us says there is no way they would shutdown the courts and leave hundreds of thousands of homeowners to face foreclosure without the ability to use the federal rights that they, their fathers and their children have fought to maintain. But then again, this is the same federal government that has laid off hundreds of thousands of workers who have entrusted their careers in this government. Don’t let your optimism or patriotism sway your thinking. Just do what you feel you have to do. Do it decisively and without delay and you will be alright. If you are sitting waiting for the government to tell you that you will be alright, history indicates you are putting your eggs in the wrong basket.